With my FIFA: Ultimate Team experience getting boring and repetitive, I was chomping at the bit for the month’s Playstation Plus games on PS4 – although they were all indie games (A familiar sight on PS4 – give me Knack!) this was sure to be a great month. Never Alone had some great reviews, and Tower of Guns looked like it shook up the FPS formula a little. Then there was Aaru’s Awakening… that was just another 2D sidescroller that I would definitely pass by. See, when I first got my PS4 around a year ago, the PlayStation Plus game of the month was Mercenary Kings, a 2D sidescroller/run-and-gun that rejuvenated a played-out genre for me, and I was looking forward to similar offerings in the coming year. What I didn’t expect, however, was for an avalanche of 2D sidescrollers to be dumped on me every month. I’m not one to complain about indie games-they’re some of the most imaginative and innovative games out there-but if Sony hopes to make their PS4 subscribers feel that they’re getting their value for money, then they need to add a bigger variety of game genres. Scouring my PS4 library, I recently realized that more than half of the games I’d received from PS Plus were 2D sidescrollers. It’s not that PS Plus doesn’t sometimes knock it out of the park- December and January gave us superb superhero fighter Injustice: Gods Among Us and Second Son standalone DLC Infamous: First Light respectively – but the whole Driveclub: PS Plus Edition debacle really hasn’t helped Sony accommodate new PS4 owners properly in what, before Bloodborne came around, has been a tepid time in terms of games for PS4 owners. Now don’t get me wrong: platformers such as the Strider reboot, the aforementioned Mercenary Kings and Shadow Complex are amazing, but in moderation. Play platformers constantly and you’ll find that there’s always the most basic formula in every 2D game. It’s sort of surprising that those 80s kids survived. Yes, they lived… But what they clung to was a half-life. A shadow. Jesus, is that a denim vest? But enough ranting. How good were this month’s games? 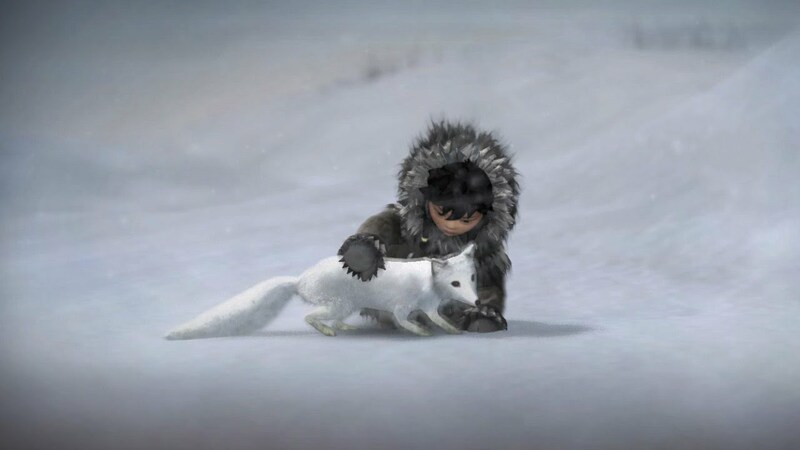 Playing Never Alone was an absolute pleasure – the game was so polished and the story so beautifully told that I couldn’t stop playing, and the 1-player co-op worked well. I’m pretty sure that every single mechanic in the game had been done before, but Never Alone is more than the sum of its parts. It was one of the most fresh and compelling platformers I’d played in a while. Aaru’s Awakening surprised me hugely. Its hand-drawn world is aesthetically pleasing, and it has a really cool mechanic in which your character can teleport around the screen as if they were jumping. This adds a lot of tension to the game since figuring out where you’ll reappear is an inexact science. Will your teleportation result in your demise, or will it be to your benefit? To top it all off, I played some Tower of Guns. The game did what many platformers had done to me before-I got bored of the FPS elements in about half an hour. Although developers claim the guns are outlandish and crazy, they actually seemed a bit tame to me. Long story short, I learned a valuable lesson this week. Maybe there are too many 2D sidecscrollers generally speaking. But a genre can’t define a game. Only its gameplay can. I have my own gaming blog called Gadgets and Khajiits, if you want to check it out! Currently in high school, I mostly play open world games and binge-watch anything on Netflix.